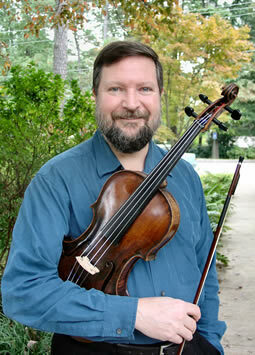 William Bauer, baroque viola & viola d'amore, comes from St. Louis. He began his baroque studies on the viola d’amore under Joseph Ceo (University of Rhode Island). Subsequently, he has studied baroque violin with Reinhard Goebel (Musica Antiqua Köln) and Richard Gwilt (London Baroque). He appeared at numerous concerts, and has been a soloist at the Iraklion International Festival (Crete), the Lisbon and Vancouver Early Music festivals. He has produced solo recordings for the well-known labels such as Deutsche Grammophon, Polydor, Naxos, First Edition, Nannerl and Studio 115.